I've begun to take inventory of what I have, what condition its in (since most of this stuff hasn't been touched since I put it together after Christmas... of '07 or so) and what I can do with it in the game. My work area is a bit of a mess, but you can see the beginnings of what will be one of the strong platoons made of the remnants of the old Crixus 7th Expeditionary Legion, plus assorted creeps and nasties. Each squad will have a vox creep, because frankly they are just too much fun to build. I'm not trying to think too hard on future purchases, since I have plenty to build and convert, but the crypt ghoul creeps are really growing on me, so I know if any purchases other than the odd part are needed its likely to be crypt ghouls. 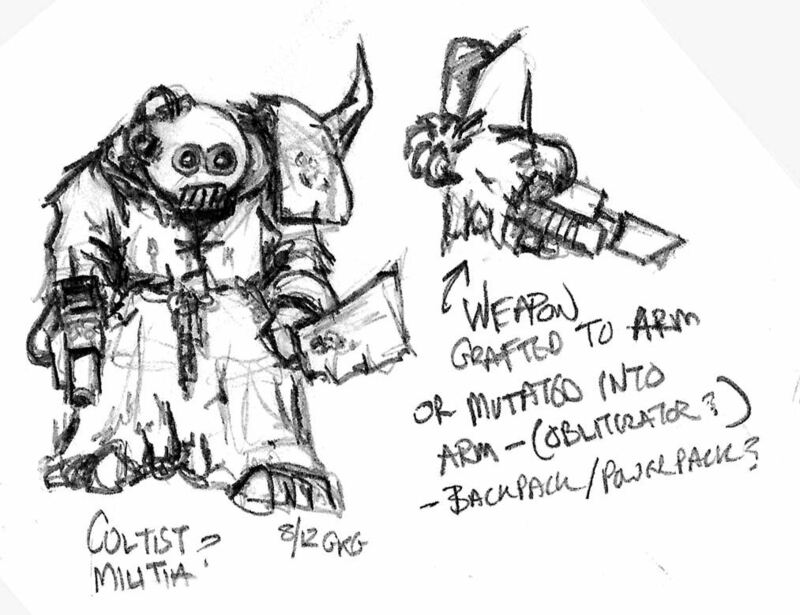 I'm thinking about Weapons teams with gun creeps. And for 'bodyguards" Draugar will have shield creeps... though I'd envision it more like he sees an incoming threat, grabs the unlucky creep by the neck and puts him in the path of the incoming round, rather than the creep being all noble and jumping infront of it to save his commander. For the first platoon of basic infantry, however, I'm going to run with the forgeworld militia/cadian look (with some Catachan parts) I have 4 old Steel Legion missile launcher arms (the ones that kindof look like RPG's), so I'm forming the 4 platoon HW teams around them. 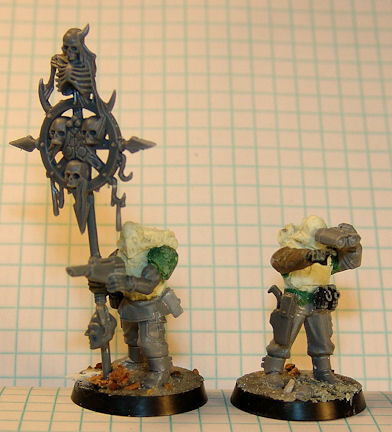 Still working on how to make medics for the command squads, since creeps are too dull for that.... maybe the hooded Plague Monk bodied things. Still lots to do. HOWEVER.... I finally played my first game of 6th edition today with my Templars of DOOooom. They actually did great. My dice were uncharacteristically kind to me, while my opponents were not kind to him. The DOOooombull killed Logan Grimnar and may have to have his base augmented with a nurgling that issues challenges for him. Though eventually killed by Logan's second (damned storm shield)... the DOOooombull did very well and held up Logan and his large unit of wolfguard for a good part of the game...after they killed Smilin' Bob the Defiler when they landed in their drop pod. Serves 'em right. It was a very fun game, none of my guys killed themselves with their own plasmaguns (though one of the spacewolves did)... and though technically a draw in the end, the boys made a good account for themselves and outnumbered the 9 wolfguard left on the table at games end by at least 2-1. Much better than my usual, 3 guys left standing at the end like normal. A new league has started up and I'm mulling taking the kids out for a league run. 1500 points. I might do it...or I might just keep using Wednesday nights as a painting night, I haven't decided yet. 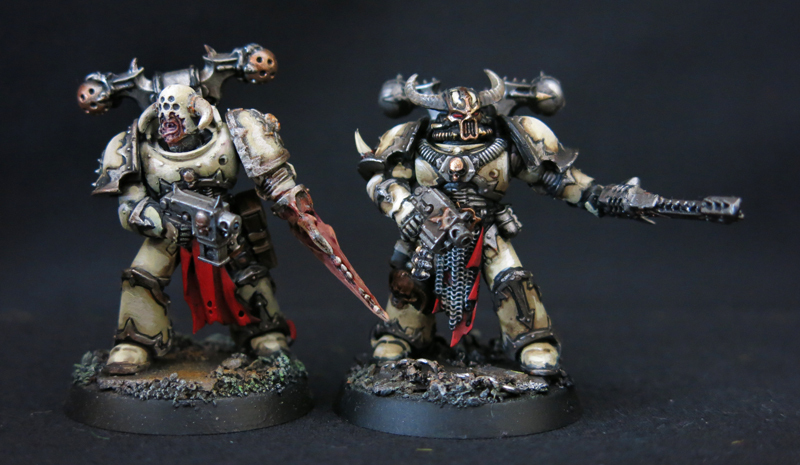 Either way, I may be painting some of my chaos marines alongside the traitor guard in the near future. I converted a squad of veterans probably 5-6 years ago. Its interesting to see how my abilities have improved since then then. But I figured I'd try to improve on them a bit so they would better mesh with the army I'm building. The old versions(which I probably should have taken a picture of them before) were basically the same as they are now but with beastman heads. Some head changes (I tried zombie heads first, but they didn't look right with the bulky catachan arms) and some clean up and here's what I came up with. OH.... and the requisite vox beast. Here's a close up on the Sergeant. .... AND the squad's radio creep. Like many, I've seen the pictures of the minis to be released with the 6th edition starter set. And like many, I have drooled. Since I would use all of them, I am seriously keen to get my grubby mitts on the set when it comes out. In the meantime, I have the monumental task of figuring out what I have available to build this army. 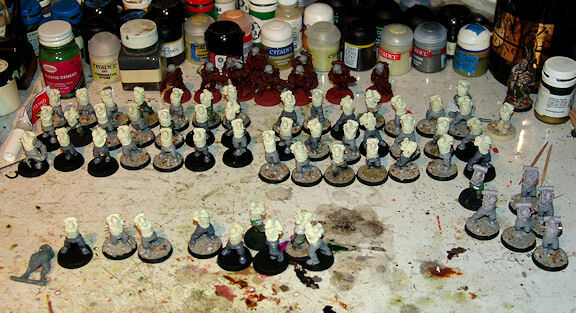 I have around 60 forgeworld chaos militia torsos, most of which are already married to Cadian legs. I have a unit of "veterans" I converted years ago, with beastman parts (more on them later- and their 're-conversion') I also have 40 plague rats and 40 of these-Cool looking heads ... so here's a doodle I came up with. Still trying to decide the place these critters will take. Guard "regulars"? Penal troops? Dare I say.... veterans? Working with the obliterator-like weapon from the flesh kind of thing, the only limitation is what I'm willing to convert. Conscripts are out- because I need some zombies. 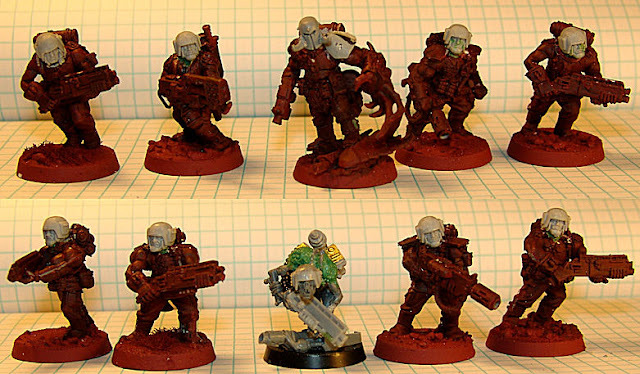 I have 60 of the forgeworld militia, so I figure they could be one platoon of regulars. Maybe these guys are another platoon. Next post will be the re-converted veterans (I already did a headswap and I'm not sure I like it) and hopefully the prototype of this little guy. I also got a nice little envelope from a new friend in Warsaw, Poland to realize another project I've been wanting to do for a very long time. It has something to do with Meso-American cultures....and the grimdark of 40k. I get chills just thinking of it.... and a headache thinking of all the converting. I'm starting to believe I do have ADHD, can't do one project at a time. A commander is only worth a damn if he can command. So, to communicate he needs a good signalman... or signal-creepy-thing or signal-ghoul or whatever you want to call it. I present to you Master Voxx. I wanted a creepy radio beast of sorts. A psychic thing married to the vox machine. Crypt ghouls are just creepy, nasty things and I always love using cool stuff from the fantasy line (since I don't play the game) just to be a little different. 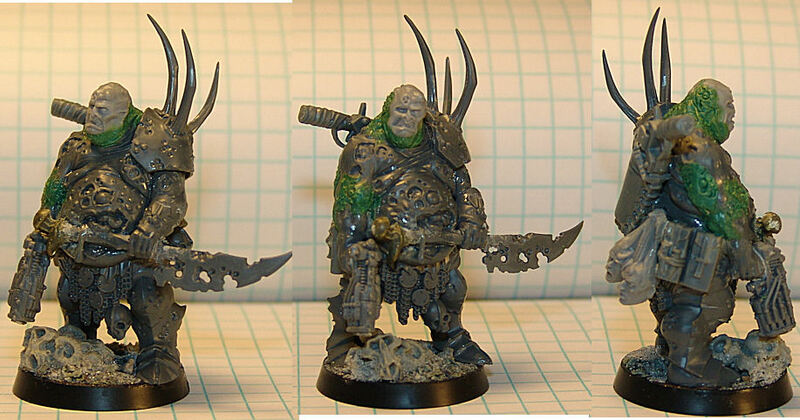 I sculpted a bit of a hunched shoulder and some nurgly, funky brain stuff on his skull. 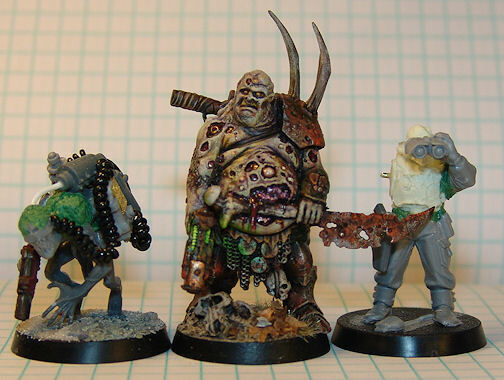 The head is from the old fantasy mutation sprue, with a blindfold and mouth sowed shut. IG radio parts, an orky grenade launcher, some old photo etch brass from 1/48 scale cockpit kits and some floral wire completed the mess. I'm quite pleased with him for the vision I had. That's all for now, look for another post Saturday or Sunday. He's mean, he's ugly and he's painted. Ahnek is his rank among the former 7th Crixus legion, the right hand of their Deamon Prince lord. What his name was in his former life before the Legion was lost to the Warp is a source of much speculation, but he has taken the name of an angry, indestructable flesh eating spirit of ancient myth, fitting now as he does his masters bidding feasting on the vulnerable worlds at the spinward gate to the Crius Archipelago. Or at least that's the 'cool' background until I actually start playing the army. Once the games begin, my normally inconsistant ability to roll dice will undoubtedly create some sort of not-so-serious/sadly comical background for him and the army. In the meantime, I'll bask in his rotting glory and stinky badassery, until he embarasses himself on the tabletop. I start the command squad tomorrow. The plan is to do a full command with several options, most of which I likely won't use in the average game, since with "Straken" and all the bells and whistles, it comes out to around 300 point. But we'll see. I've got guardsmen, forgeworld traitor militia,crypt ghouls,zombies and nurgly deamons (just to name a few) to cobble together this army. Its going to be some twisted kind of fun. Also hope to finish up the sculpting of fur on the Warpig's head. So, there should be an update in the next day or so. The Bloody 7th: Iron Hand Straken Stand-in. Here's my stand-in for Iron Hand Straken. He's a bit Nurgly. More work on the Warpig coming up, so keep an eye out.